“Some people complain that when they pray to God they do not feel His presence. We should know that this is due to our incapacities, not God’s… The physical conception is temporary, whereas the vibrational conception is eternal. When we enjoy or relish the vibration of Krishna’s teachings in Bhagavad-gita, or when we chant Hare Krishna, we should know that by those vibrations He is immediately present. He is absolute, and because of this His vibration is just as important as His physical presence… Such association with Krishna and the spiritual master should be association by vibration, not physical presence. That is real association. We put so much stress on seeing, but when Krishna was present on this earth, so many people saw Him and did not realize that He is God; so what is the advantage of seeing? By seeing Krishna, we will not understand Him, but by listening carefully to His teachings, we can come to the platform of understanding. 13 May, 1973, Morning Walk: Devotee: Srila Prabhupada, when you’re not present with us, how is it possible to receive instructions? 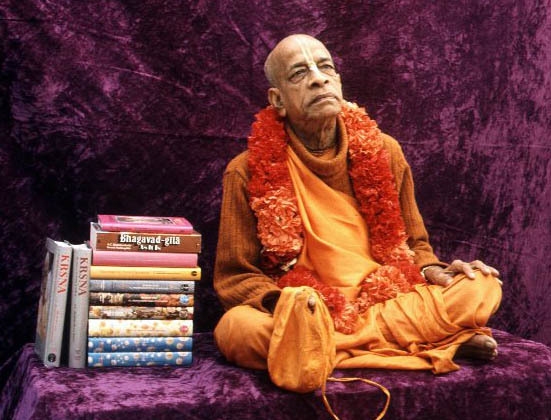 For example in questions that may arise… Srila Prabhupada: Well the answers are there in my books. Paramananda: We’re always feeling your presence very strongly, Srila Prabhupada, simply by your teachings and instructions. We’re always meditating on your instructions. Srila Prabhupada: Thank you. That is the real presence. Physical presence is not important. Srila Prabhupada: Spiritual Master is not question of…Spiritual Master is eternal…so your question is ‘without Spiritual Master’. Without Spiritual Master you cannot be at any stage of your life. You may accept this Spiritual Master or that Spiritual Master. That is a different thing. But you have to accept. As you say that ‘by reading Bible’, when you read Bible that means you are following the Spiritual Master represented by some priest or some clergyman in the line of Lord Jesus Christ. Who will succeed you when you die? Srila Prabhupada: I will never die. I will live forever from my books and you will utilize. Prabhupada: The devotee’s vision is: in everything there is Krishna. That is a fact. Just like we are using this dictaphone and tape record. It is material things. Sometimes they accuse that “You are against material things. Why you are using these material advantages?” Do they not? You do not meet such men? Adi-kesava: Yes. Prabhupada: But for us there is nothing material. We have no such vision as “material” and “spiritual.” Material means when we forget Krishna’s right. Hari-sauri: …Krishna’s energy is all-spiritual, then why in Bhagavad-gita does Krishna make a distinction—”My separated material energy”? Why does He say, “separated”? Prabhupada: Separated… Just like I am talking and this will be reproduced as it is, although it is separated. Hari-sauri: So He’s not personally present there. Prabhupada: Yes. When you replay, the same voice will come, but I am not there. So if you want to utilize this separated energy for Krishna consciousness, then it will help you. Just like the Deity. So our philosophy is that. Although this material world, bhumir apo ‘nalo vayu’, they are separated from Krishna, we can use it for Krishna. Just like the same example: The tape recorder, it is material, but it can be used for Krishna’s purpose. We are writing books, recording in the tape recorder. That nirbandha krishna-sambandhe yukta vairagyam ucyate. There is no need of giving up this bhumir apo nalo vayu, as the Mayavadi philosopher says. You can utilize. After all, it is Krishna’s energy. This is the best philosophy, that one man’s property should be used for the proprietor. That is the best use.